AAS Ultra Analog running under Ableton's Live 4. Once upon a time, the idea of IRCAM — the Paris-based music and acoustic research establishment — producing anything populist, commercial or, in some cases, comprehensible seemed faintly ludicrous. Not that their work wasn't fascinating, but in recent years, the computing power available to the rest of us has caught up somewhat with those at the cutting edge. The result is that the likes of IRCAM do release commercial products and of course, those who have passed through their doors have often gone on to more commercially minded concerns. Such is the case with Marc-Pierre Verge and Philippe Dérogis, the names behind Montreal's Applied Acoustics Systems. Both are musicians with a heavy background in physics, mathematics and acoustics. AAS's products, however, are not heavy, but put a friendly gloss on some serious coding. A lot of the work done at IRCAM would now be classed, broadly, as physical modelling: simulating real acoustic events with computers. Indeed, AAS's first product, Tassman, is a powerful physical modelling synth. Various incarnations of Tassman have been reviewed in SOS (see the July 2000, June 2003, and November 2004 issues). Since the release of Tassman, AAS have moved sideways into modelling classic electric pianos with Lounge Lizard and taken a stab at replicating string-based instruments with String Studio. Their latest product sees them returning to their synth roots. Ultra Analog costs less than Tassman, but it's also rather simpler to use. Where Tassman is a fully-modular creative environment, UA is a 'boot-and-play' affair, though no less inspiring in the right hands. Unlike many software synths of today, Ultra Analog wasn't modelled on any particular hardware synth, but if you think of any two-oscillator analogue synth, you'll get the basic idea. UA is not monophonic like most two-oscillator analogue synths (in fact, it's up to 32-voice polyphonic) but it can be made monophonic if you want to be purist. And though not fully modular, it has modular elements. UA 's look is clean and approachable, with the various synth elements grouped into logical, colour-coded sections. Oscillators, including LFOs, are blue. Filters, of which there are two, are red; the same goes for the filter envelope generators. All the modules related to amplitude (level and audio output), including amp EGs, are green. There's a greyness to the rest of the front panel, if not the facilities: portamento, overall vibrato and tuning are joined by a great arpeggiator and a handful of effects processors. The browser window, which can be displayed to the synth's left.There's only one window, though this can be expanded to include instant access to the patch library (see the screenshot on the left). Your own work can easily be saved and organised from this expanded window. In common with the rest of AAS's family, Ultra Analog is cross-platform, running under Mac OS 10.2 or higher (on a Mac with a minimum 733MHz processor) or Windows 98SE, 2000, ME or XP (on a PC with a minimum 800MHz processor). There is no compatibility with Intel-based Macs yet, but as of this review AAS had announced that development was under way. Most plug-in and audio standards are covered, such as ASIO, MME, VST, ASIO, AU and RTAS, and the software will even run as a stand-alone synth, which is great if you just want to do some virtual tweaking without the distraction of your audio host. You might be thinking that Ultra Analog is in some way related to Tassman. While there are sure to be features in common, UA has apparently been designed completely from scratch. It's a different beast to the more expensive synth and you won't, for example, be able to load patches from one into the other. First, let's have a look at the basic signal path — old hands will know what to expect. A quick glance reveals two more or less identical sets of main sonic modules, each set offering oscillator, filter, LFO and a pair of EGs. The PDF manual is good at explaining all this, although some newcomers may find it a little obtuse. 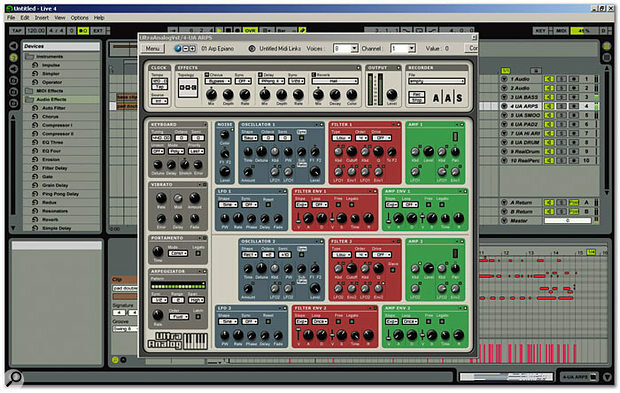 It covers technical details in a comprehensible way, but I say that as an experienced synthesist. The oscillator starts well, offering sawtooth, rectangular, sine and white noise waveforms plus an octave-below sub-oscillator. AAS have obviously had a lot of experience of different oscillator types; to me theirs is more ARP than Moog, though the warmth and fatness of the latter are present (not to mention the metallic potential of a Korg MS20). With a rectangular wave selected, a pulse-width control becomes available, and this can be modulated by an LFO for the classic effect. I wonder why AAS didn't go the extra mile and offer pulse-width control over other waveforms? Tuning control, however, is comprehensive: there's course and fine tuning, and oscillator detuning options. Keyboard tracking is completely controllable — equal temperament is at 12 o'clock — and this parameter is also modulatable by an LFO. A sort of glide effect offered by the (unlabelled) ramp generator is also worth deploying to add a little indeterminacy to the pitch at the beginnings of notes; the Time and Amount knobs are what you need for this effect. Oscillator hard sync, a classic effect, is also available, from either Oscillator 1 or 2, but is only available when rectangular or sawtooth waveforms are selected. Finally, each oscillator has a mini mixer to allow you to route the audio to filter 1 or 2 and set the overall level and balance between the oscillators. A dedicated noise generator sits next to Oscillator 1 (but not Oscillator 2); this simple device has routing controls to the filters, and a 'colour' control to modify the frequency content of the noise. Next up are the resonant multi-mode filters themselves. Each is capable of low-pass, high-pass, band-pass and band-reject (notch) operation, and there's a nifty formant option that really does add a human edge to patches (there's a choice of male, female or child settings). Depending on which type of filter is chosen, you'll have access to six-, 12- and/or 24dB-per-octave operation. 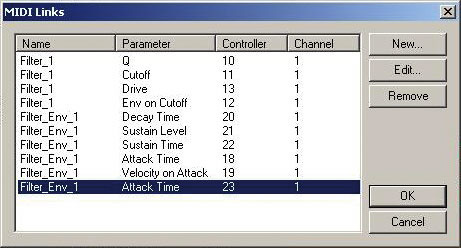 More grit can be added with a choice of saturation algorithms available under the Drive menu. Cutoff Frequency and resonance (Q) controls are present, but are accompanied by a range of options you may not have seen elsewhere. Each has its own keyboard tracking control — a subtle change from the global tracking you'd normally encounter. EG and LFO routing are also individually assignable to cutoff and Q. The last filter parameters differ from module to module; Filter 1 has a routing knob to Filter 2 for operating in series, while Filter 2 has a 'slave' switch that causes Filter 2's frequency to follow that of Filter 1, though with an offset defined by Filter 2's 'frequency' knob. 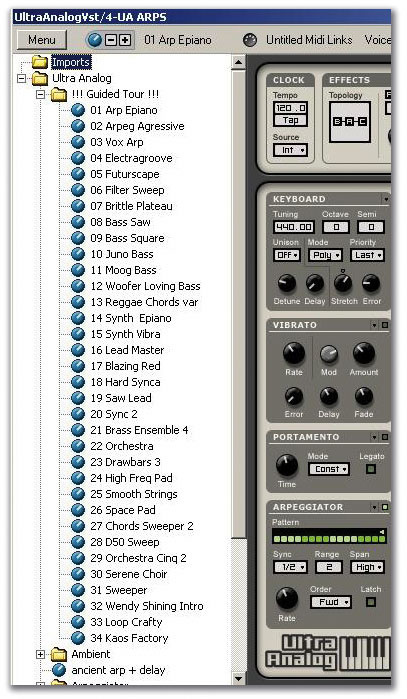 Arpeggiators, it seems, can be found in almost all synth-based software except for Propellerhead's Reason. AAS have designed a nice example (in the bottom left corner of the UA window) which offers a little more than the most basic models. It lets you break up held chords in a rhythmic fashion, but with control over the basic rhythmic pattern via a 16-step grid. There are some other simple controls: transpose range, span (which determines whether the transposition goes up, down or over the whole note range) and note order, and you have the option of sync'ing to MIDI or internal clock as required, but that's about it. I'm pleased to see a 'latch' option, so arps keep going once your hands leave the keyboard, but on my AAS request list is a 'transpose' option, so you can move the pattern up or down with one finger — I miss that from classic hardware such as Roland's SH101. An amplifier ends each chain of modules. There's nothing amazing here as such — the signal comes out of the filter and into the amp, you control the level and pan position, and that's more or less it. Keyboard tracking can be applied to level and pan, though, with LFO and EG modulation. Check out the useful, if faint, Level LED. I've mentioned the main modulation sources in passing: there are two LFOs, two filter envelope generators and two amplifier EGs. All are well specified, with perhaps the only drawback being that the modulators are only routable to similarly numbered target modules — so LFO 1 can't be routed to a parameter on Filter 2. You can duplicate a module full of parameters in one go, or initialise it completely for a fresh programming start.The free running or MIDI-clockable LFOs both produce sine, triangle, and rectangle waves, plus two varieties of random waveform. The modulation effect can be delayed or faded in, and a pulse-width control is available for rectangle and triangle waveforms, adding interesting sonic movement related to the resulting changes in symmetry of the waveform. AAS have made their LFOs polyphonic. The modulation effect starts anew with each note played, and a Reset button and Phase knob let you alter how the cycle starts, to a certain extent. Finally, if you choose to sync to MIDI (or internal) clock, a wide range of straight, dotted and triplet-note values is available. All four envelope generators have identical parameters, and though the envelopes are based on a standard ADSR shape, Ultra Analog goes a little further under velocity control. For example, a Time parameter next to the Sustain portion of the EG curve acts almost as another step in the envelope. There are two choices of slope, exponential or linear, which have a subtle effect on the shape of the overall curve, but an often dramatic effect on the audible result. Further performance tweaks can be made using Free Run and Legato switches. The former bypasses the sustain portion and loops the release stage automatically. Legato lets you decide how newly triggered notes are treated when an envelope has already been triggered, and looping options allow you to control which stages loop while a key is held. The oddest front-panel feature I noted on first launching this plug-in was the Recorder. After the double take, I had a play and found it very useful. Recording works in stand-alone mode, or when the plug-in has been enabled in a host. Now imagine you've got something interesting going with a UA patch in a mix or performance that you'd like to deploy elsewhere. Easy — you just press the plug-in's Record button and save the audio. There's no need to mess with host computers' audio system, and because an audio file of a performance will usually demand less of your system than an instance of Ultra Analog, you can fine-tune a performance, record it as audio, and then reload it into an audio track, freeing up real-time DSP for a further instance of the plug-in. That's not all there is to UA, however. As I've mentioned, the oscillators (and the noise generator) can be routed to either filter. On a more mundane level, it's worth noting that most individual modules, and many of the parameters within the modules, can be enabled or disabled at will. This has the dual advantage of letting you be very precise about programming and allowing you to remove unused elements to save on your computer's DSP power. Furthermore, settings from like modules can be copied from one to the other (as shown in the screenshot on the previous page), or reinitialised. All that remains, from a strictly voice-creation point of view, are the Global modules. The one labelled Keyboard governs overall tuning, and mono/poly mode, with a Unison option thrown in. The Stretch and Error parameters add controlled or random tuning variations, emulating something genuinely old and in need of a service, although stretch tuning, of course, is a term from the world of piano tuning. As if two LFOs weren't enough, the Global Vibrato module adds a little extra to a patch, and delay and fade options help make the effect more natural. Finally, portamento, or glide, also gets a Global module to itself. Effects aren't really a necessary addition to Ultra Analog 's sonic arsenal — most of us will be working with a software host that offers plenty in this line, and freebies abound on the Internet. But here they are, and AAS have kept it simple so that the effects don't get in the way of the core business. Modulation, delay and reverb modules are provided, each with a handful of significant parameters. Four choices of parallel and linear routing include two options that treat the outputs of the two rows of synth 'modules' with a different effect each — a nice touch. The Chorus module offers chorus, flanging and vibrato with stereo options, and these effects can be sync'ed to tempo. Needless to say, there are Rate, Depth and Wet/Dry mix controls. The delay effect is also sync'able, and the options here mix realistically retro with precisely modern in effects labelled 'ping pong', 'slap back' and 'tape', which should give you an idea of what's available. Finally, the reverb module will not replace anything your host software can provide, but approach it as part of Ultra Analog 's editing facilities and you won't be disappointed. It's a little ringy and crunchy, but can help add air and space to a heavily delayed or arpeggiated patch. Algorithms range from small room to various sizes of hall. MIDI controller links to on-screen parameters can be made manually in this window.It would definitely be remiss of AAS if they hadn't provided a way to access on-screen parameters via MIDI controllers. But they have, and it's simple and powerful. Links to outside controllers can be made by holding down the Control key and clicking on a parameter (on the Mac version — PC users click with the right mouse button as usual) and sending the desired controller data. Nearly everything on screen can be so addressed. The parameter learns the link, though the user can edit this as required and customise how the parameter responds to any incoming data. What's best is that a screen full of MIDI links can be saved as easily as if it were a normal patch. This works because UA 's on-screen elements are always in the same place — so if you have a way of controlling Ultra Analog with a particular hardware device, you can import that MIDI map into the plug-in for use with another patch at another time. Working with Ultra Analog is a doddle. The interface is really approachable, and great sounds just pour out of the synth as you get to grips with it. I'd barely auditioned the factory presets before I was creating folders full of my own. On the subject of the factory set, it's hard to summarise the huge collection. Even AAS must have seen the trouble coming, and have created a hard-to-miss folder of patches called '! !Guided Tour!!' which gives you a taster of thunderous basses, arpeggiations that will seem impossible until you've played with the synth, full-frontal leads and some of the warmest, huggiest pads this side of an ARP Quartet. And any 'voice'-themed patch will have you whizzing over to the 'formant' filter options for some experimentation of your own. UA appears to be a fairly efficient plug-in that doesn't make huge demands on its host. But a really busy patch with lots of delay repeats and a long reverb can get a bit much, and you'll be hard pressed to get multiple instances to work (UA is definitely not multitimbral!). If I had to nitpick, I'd have a go at the size of some of the on-screen buttons — those that disable modules and parameters are particularly small. And the stereo output level meters (to the right of the effects) can be really faint and hard to read. Some other elements — the 'LEDs' which indicate the normal or central position of some knobs, for example — are also really faint. Ultra Analog 's main selling point has to be its selling point; for the money, this is a lot of synth. 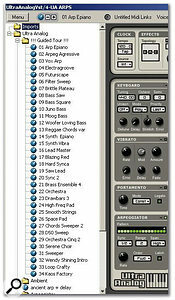 There's stuff missing when compared to more expensive software, but it's nothing that you'd notice while you're having such a ball making new sounds (if you're feeling a bit flush, though, check out the AAS modelling bundle: all their current plug-ins are included, offering an insane saving on the individual packages). In short, I heartily recommend AAS's Ultra Analog to anyone who likes working with computer-based synths. The simple interface hides the heart of an analogue beast — from throbbing bass to supersonic leads, it's all here. Some of the on-screen graphics are a bit small. Reverb not to my taste. Given the price and target market, I've no serious complaints with Ultra Analog, as you can see from my cons above! If you only have money for one serious commercial synth plug-in, make it this one.